Panzer Corps is not a new game. It's been out since 2011, and is a faithful remake (in all but name) of a game first released twenty years ago. None of which matters. In 2014, it's still one of the best strategy games you can get on the PC. Despite being a huge Panzer General fan growing up, to the point where I even created my own crude maps and scenarios, the release of Panzer Corps (a spiritual remake since the actual Panzer General games are doing...other things) kinda passed me by. That was until it turned up on Steam earlier this year, and I grabbed a bundle that included all the game's various campaigns and scenarios. Hundreds of hours later I figure it's about time I wrote about it on Kotaku. 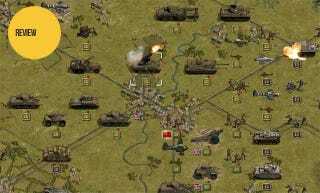 Panzer Corps is a turn-based strategy game. You face off against an opponent on a battlefield split into hexes and have a certain number of turns to complete an objective, which is normally to capture a certain number of cities. Ever play Advance Wars? Yeah, this is that, only with Panzers instead of Medium Tanks. The game's strength comes from its simplicity. This isn't a game that asks you to learn 150 menu commands or keyboard shortcuts. Because all you have to worry about is moving units then having them fire (and occasionally resupply), the majority of your time can be spent on what matters most: tactics. There are hundreds of units in the game, and each has their own strengths and weaknesses, all of which can be amplified (or nullified) by both the terrain and the weather. Unlocking how all this works is the key to winning in Panzer Corps, because there's no strategic element allowing you to endlessly build more units. Nor is there time for turtling, since literally every single mission has a time limit. Instead, there's just you and the army you took onto the field, so you need to get onto the front foot immediately and get killing before the clock runs out. Which is intimidating at first (unless you've played these, or something like Advance Wars, before), but once you get the hang of it, and learn how to get your Panzers rolling so that you never dig in for a siege, it's one hell of a rush. I'm not 100% sure just why. I've played loads of games very similar to this that don't cut it. I'm coming around to the fact that rather than nailing one tactical trait in particular, it just does everything well. The allowance of movement, the fact it predicts battle results before you commit, the visual cues, the placement of bridges and airfields on the hand-drawn maps...everything just works, and is where it needs to be, and never once are you made to feel like something is unfair, or broken. Of course, this dedication to creating thrilling tactical scenarios comes at a cost: authenticity. While every effort has been made to depict the units accurately (and the quaint hand-drawn art really does grow on you), gameplay always comes first. So truly devastating units are rare, things like morale are overlooked and scenarios don't tend to change much in terms of difficulty; overrunning France is no easier than the battle for Moscow. That flexibility with history cuts two ways. If you're successful enough across missions you'll drastically alter the outcome of the war. Play as the Germans and you can end up conquering the USA over three gruelling stages. Play as the Allies and you can beat the Russians to Berlin before taking on the Soviets themselves. Which will make some types go "oh, that's dumb", while more interesting people will be happy for the chance to use jet fighters and giant tanks. Part of the reason I've played hundreds of hours of Panzer Corps in only a few months is because the game is so damn good, but another is that there's just so much to play. There are a number of full campaigns from the German perspective, including an epic 1939-45 one that can end with you conquering Britain and the USA. There are dozens of scenarios. There's a dedicated campaign just for the North African campaign. And that's just for the Germans. You can also play as the Western Allies, which not only brings more campaigns, but they're fresh challenges, too, as they take place mostly on new maps. (Note that you can buy either all of this as a bundle on Steam or smaller chunks individually). I'm not going to say this game is for anyone who likes strategy gaming, or anyone who's into Second World War history (or alternate history). Those who prefer their strategy a little on the heavy side, ala Hearts of Iron, might find the chess-like simplicity on offer here a bit too light. And those who are sticklers for developers getting the penetration of an 88's shell through a particular British tank's hull just right might also find this too abstract. The people who should be looking into this are those who love turn-based tactics above all others. That rush of a proper plan well-made and well-executed. You get it from XCOM and you get it from Civ, and you sure as hell get it from Panzer Corps.